Shadow, Buster, and I had regular Adventures to Honeymoon Island State Park in Dunedin, Florida. As suggested Honeymoon Island State Park is a Florida State Park located on Honeymoon Island. The Park is 385 acres and has four miles of beaches and many more acres submerged. 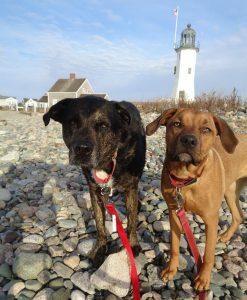 There are trails to walk and a variety of beaches, one being dog friendly. The Island is popular for swimming, hiking, biking, and shelling. We had just about weekly Adventures to Honeymoon Island State Park, which quickly became our favorite dog friendly beach, and really one of our favorite spots in general. I think every person that came to visit us in Florida had at least one visit to this gorgeous beach. We even took Christmas photographs there one year, our New England friends and family noting it looked like we were posing in the snow. Beautiful white sand, perfect water temperature, and of course warm and sunny Florida weather. Definitely a perfect tropical retreat! I termed one of the other beaches on the Island as the “shell” beach, which we quickly stopped visiting with Shadow and Buster joined our world. However, a wonderful stop for those in search of the perfect shell, or a scenic swinging bench. Our typical visit to Honeymoon Island included walking along the beach, swimming, resting in the sand, digging, and of course energetic play sessions. Shadow and Buster used to playfully argue over the holes they dug both thrilled, and energized by this entertaining game. Such a fun memory of our lives in Florida. The only downside was an encounter with a rattlesnake one visit, and an occasional burr on the path to the beach, however even these moments come together to create a spectacular Adventure. If you are ever in the Tampa area, I encourage you to visit this magnificent Park. It will always be special in our hearts, and hope that some day we will be back.